WANT TO KNOW WHO WILL WIN THE WHITE HOUSE? WATCH THE STOCK MARKET | "Global Possibilities"
Investors are a bit like gamblers: They’re either betting on future returns or folding their cards and moving to the next round of betting. And as of Tuesday these players in the U.S. stock market seem to be placing their chips on the prospect that Republican candidate Donald Trump will inherit the keys to the White House. For those who have nightmares thinking about Trump’s commanding an army, starting trade wars and redecorating the Oval Office, this market sentiment is nothing to dismiss. 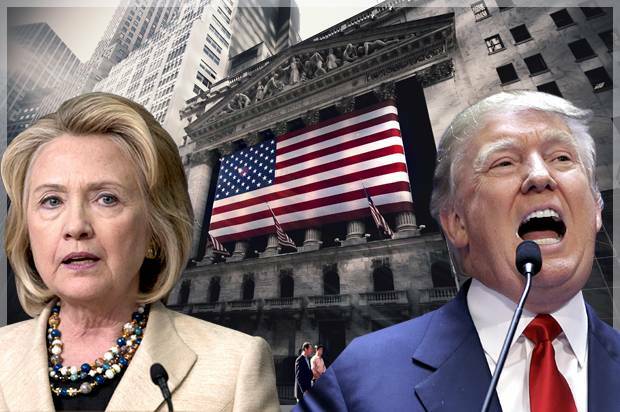 The performance of U.S. stocks has predicted the outcome of presidential elections more than 80 percent of the time in every election since World War II, according to market analysts who have studied the correlations between stock prices and presidential election outcomes. Stovall has looked at the way U.S. stocks have performed ahead of the elections for each race since Democrat Franklin D. Roosevelt beat Republican Thomas E. Dewey in 1944. What he found was that 82 percent of the time the incumbent party or candidate won the election if stock prices rose from July 31 to Oct. 31. Challengers have won if the stocks dipped in that period of time. While all three markets are up for the year, Stovall said, the final three months are key because it’s the time between the party conventions and Election Day, when investors can adjust their portfolios based on which candidates have been selected from both major parties. Stovall’s finding is supported by research from Daniel Clifton at Strategas Research Partners, a New York-based broker-dealer, who found a similar correlation over the past 22 elections, dating back to 1928. Looking any earlier than the late 1920s is difficult because so few companies were listing stocks then and available data is scarce and less reliable from that period. This doesn’t mean everyone who wants Clinton to win should run out and buy stocks. It’s not an issue of causation but rather of correlation. Market performance is a symptom of investor sentiment. If stocks are up, they’re up because investors believe the economy is doing well, which favors the incumbent candidate or party. And anything that smells like uncertainty (and what does Trump’s candidacy represent but that?) is toxic to stocks’ value. If the incumbent is viewed as having a good chance of losing the race, investors sell and stock markets fall. But as is the case during any presidential election year, other factors are at play that can throw off the market-prediction phenomenon. Market activity didn’t accurately predict the outcome during the 1968 race when Democrat Lyndon B. Johnson dropped out of the race on growing discontent for the Vietnam War. His replacement, Hubert Humphrey, lost to Republican Richard Nixon, even though stock prices had increased ahead of the election. The markets also climbed in the months before the 1980 presidential balloting, but incumbent Democrat Jimmy Carter lost to Republican Ronald Reagan, thanks in large part to the Iran hostage crisis. If this election year winds up to be another exception to the rule, it could be in part because U.S. stock markets have been particularly influenced by monetary policy. The U.S. Federal Reserve has kept interest rates near zero since December 2008 in an effort to stimulate borrowing and promote growth. But this has also encouraged companies to engorge themselves on cheap borrowing, and in many cases to prop up the value of their stock by buying back shares and increasing shareholder dividends. In essence, nobody knows where the markets would be right now if such a loose monetary policy had not been around for the past eight years. “Our financial markets have become a Vegas/Macau/Monte Carlo casino,” famous financial manager and bond champion Bill Gross wrote in the October edition of his widely read monthly newsletter. So if this year the markets are behaving more like casinos, reflecting less the true value of stocks, it could be that the predictive model might not apply. Stovall pointed out that even if more than 80 percent of past election results were accurately predicted by market activity, there haven’t been enough modern presidential elections to solidly confirm the statistical trend. For what it’s worth: People who are really concerned about Trump’s winning the election can grab some solace from the folks who are gambling on the election. As of Tuesday, the popular Irish online betting forum Paddy Power has Clinton well ahead of Trump — an £11 bet (about $14) on Clinton would pay you £4, while £2 on Trump would pay out £5. Good luck!